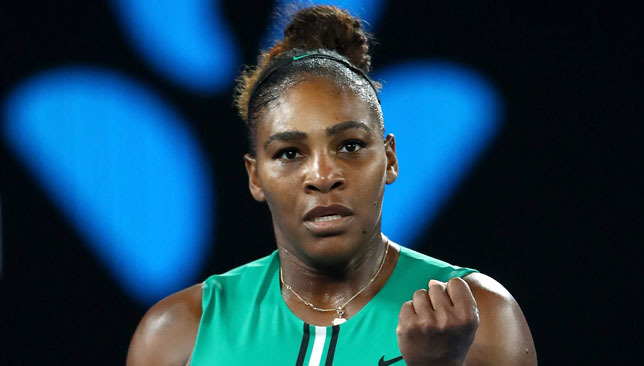 Serena Williams stayed on course for a 24th grand slam singles title at the Australian Open with victory over world number one Simona Halep in a tremendous battle on Rod Laver Arena. Halep was in the unusual position of going into the match as the number one seed but also the underdog against a player she had beaten just once in nine previous encounters. The Romanian, who saw off Venus Williams in the previous round, dug in superbly after losing a one-sided opening set to force a decider, and might well have come out on top had she broken for 4-2. But Williams saved three break points, broke Halep in the following game and served out a 6-1 4-6 6-4 victory to set up a last-eight meeting with Karolina Pliskova. Speaking on court, Williams said: “It was a really intense match, some incredible points. I love playing tennis, I love this court and it’s really cool to be back out here playing. For all her impressive achievements since returning from maternity leave, Williams had only beaten one top-10 player and had looked nervous particularly in her two grand slam finals against Angelique Kerber and Naomi Osaka. After mistakenly coming out onto court ahead of Halep when the players were announced and having to retreat into the tunnel, much to the amusement of her opponent, Williams looked like maybe she would again struggle to play freely as she dropped her opening service game to love. But the 37-year-old has looked fitter and more assured throughout this tournament and that initial impression was swiftly dispelled as she raced through the rest of the set without losing a game. Halep did not hold serve until the opening game of the second set and was then broken again as the match threatened to run away with her. But the Romanian got a foothold just in time, breaking Williams for 2-2 and from there the match changed, with Halep managing to compete with her opponent’s power. Handling Williams’ serve, unquestionably the best in the history of the women’s game, was another matter, but, when Halep did get her chance at 5-4, she grabbed it. 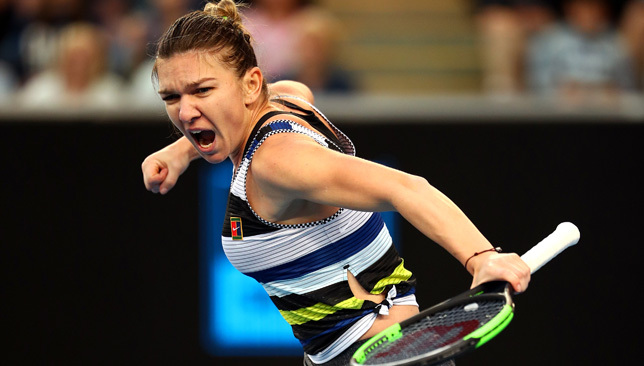 Halep spoke on the eve of the match about not being intimidated by Williams any more, and it certainly appeared that way as she confidently held serve in the early stages of the decider. Williams was the player struggling to hold on in the rallies and Halep forced three break points at 3-2 only for her opponent to save them all. That proved the turning point, with Williams seizing on Halep’s serve to break in the next game and producing some of her best tennis of the match to serve it out. Zverev has been to just one Grand Slam quarter-final. Fourth seed Alexander Zverev suffered his latest grand-slam disappointment with a bad-tempered fourth-round loss to Milos Raonic at the Australian Open. The 21-year-old beat Roger Federer and Novak Djokovic back-to-back to win his biggest title at the ATP Finals in November. But he was unable to improve his record of having reached only one slam quarter-final as he suffered a heavy 6-1 6-1 7-6 (5) defeat to resurgent Canadian Raonic. After breaking serve in the opening game of the match, Zverev incredibly lost 12 of the next 13 games and showed his frustration by destroying his racket after going 4-1 down in the second set, smashing it repeatedly on the ground. He produced a better effort in the third set and saved two match points at 4-5 but Raonic, who began his tournament by beating Nick Kyrgios and Stan Wawrinka, was ultimately too strong. 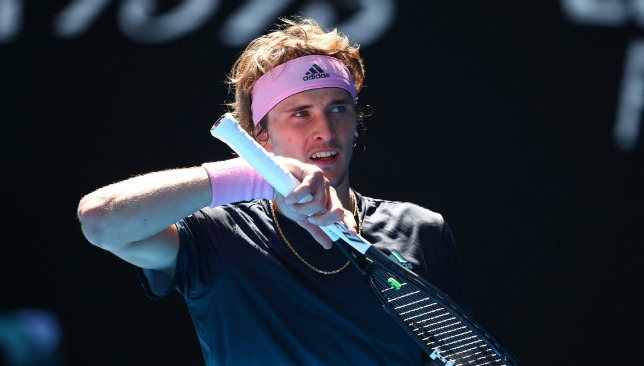 There was no doubt about Zverev’s commitment to smashing his racket, eventually flinging the mangled mess of metal and string dismissively to the court. Zverev has become all too used to the narrative that he has under-performed at the Slams and this performance felt all the more disappointing after his success at the O2 Arena. He has been seen as very much the leader of the next generation, and his results across the board reflect that, but an increasing number of different young players are going further than him at the majors. Here, that includes his good friend Frances Tiafoe and, of course, Stefanos Tsitsipas, who stunned Roger Federer on Sunday. Discussing the rivalry among the group, Zverev, who is coached by Ivan Lendl, said: “I was happy for Foe, obviously I’m very close to him. I’m happy that the other young guys are doing well, as well. Nothing but the best for them. Raonic believes he could be benefiting from his incredibly tough path through the draw. He said: “It’s not fun necessarily before the tournament starts to look at it and say, hey, you play Nick to most likely play Stan in the first two rounds. You’re hoping for a bit more time to really work your way into things. Raonic arrived in Australia two years ago looking like the man most likely to break the stranglehold of the big four after reaching the Wimbledon final and finishing the year ranked world number three. Two years of repeated injury setbacks have sent him back down the pecking order, but he believes he is a better player than he was in 2017, even if the knocks have taken their toll. The women’s Australian Open this year has shaped up to be the strongest Grand Slam we’ve seen from the ladies in a long time and I believe it’s no coincidence. The top quarter of the draw alone features two fourth-round match-ups that could easily be the finals at any major. World No. 1 Simona Halep faces No. 16 seed and seven-time champion Serena Williams, while former US Open runner-up and No. 7 seed Karolina Pliskova takes on two-time Slam champion Garbine Muguruza. Some other marquee clashes include Maria Sharapova  against Ashleigh Barty , Madison Keys  versus Elina Svitolina , and Naomi Osaka  against Anastasija Sevastova . It was a mere six months ago that people were stunned by the draw collapse at Wimbledon, where Pliskova was the only top-10 seed to make it to the fourth round, and where no top-10 seeds featured in the quarter-finals. Here in Melbourne, seven of the top-eight seeds are in the fourth round (only No. 3 seed Caroline Wozniacki didn’t make it) and the last-16 line-up is as strong as ever. I feel like the past few years of women’s tennis have been building up to this very moment at this Australian Open. The depth in the women’s game was not created overnight, and all of these so-called ‘upsets’ that we witnessed in the past resulted in a large pool of WTA players adding experience to their resumes. All that perceived instability and ‘chaos’ was just the tour’s way of ushering in new talent, and introducing different players to the big stage. Seeds having a strong tournament in Melbourne this fortnight doesn’t mean this will happen at every women’s event moving forward, but it does show that the difference between a Wimbledon like we had last year and an Australian Open like we’re having now is not that huge. The margins are slim, the competition is off the charts, and either way, we get to watch some brilliant match-ups. “I take it match by match. For me, I don’t feel any difference by playing seeded and not seeded. If you’re not playing Serena or somebody like this, which is completely different level, you still have to work for it. There’s not going to be anything for free, not even from the unseeded players,” is how Pliskova explained it on Saturday. Keys, who had a strong win over Elise Mertens on Saturday, agreed when I asked her if she felt that this is one of the strongest Slam fourth-round line-ups in a long time. “I would 100 per cent agree with you. There’s a lot of really good third round match-ups yesterday and today. It’s not always the case. So seeing that, even fourth round, they’re all tough. It’s definitely shaping up to be a very interesting first Grand Slam of the year,” said the American. She doesn’t necessarily have an explanation as to why the seeds are doing well this fortnight. Irrespective of who goes through, I think we’re guaranteed a phenomenal final come Sunday the 27th. Elina Svitolina shared a lovely moment with Zhang Shuai after she defeated the affable Chinese in three sets on Saturday. She went over to her bench to console her and make sure she was physically okay. Zhang is one of the nicest people on tour and it was no surprise that Svitolina felt the need to go check on her. “I think tennis match is a tennis match. You finish the match. Of course everyone wants to win as bad as the other person, but it’s done. She’s a very nice person. I played with her in Tie Break Tens and we had a good time. We practice sometimes. So it’s not only about tennis here,” Svitolina said later. 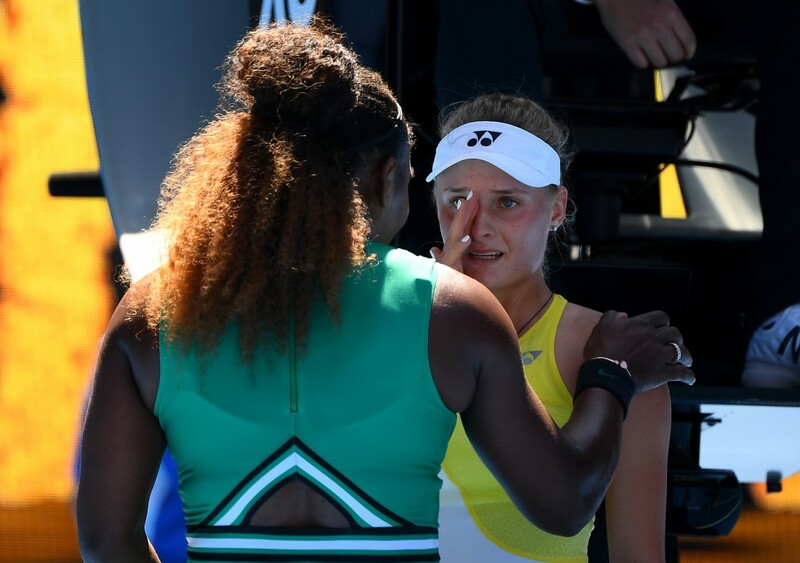 Later in the day, Serena Williams also had a touching moment with Ukrainian teen Dayan Yastremska who was in tears the minute she lost her third round to the American legend. “You did amazing. You did so well. You did amazing. Don’t cry. You did really well,” Serena was heard telling Yastremska at the net. She also had some kind words for the 18-year-old in the locker room, and even told her she didn’t think she deserved that time violation she was given during the match. “As she was walking towards the net, I could tell she was quite upset. I kind of liked that. It shows she wasn’t just there to play a good match, she was there to win. She wanted to win. That really broke my heart. I think she’s a good talent. It’s good to see that attitude,” said Serena in her press conference. Amanda Anisimova’s nonchalant beatdown of No. 11 seed Aryna Sabalenka was nothing short of remarkable. The 17-year-old, who is the first player born in the 2000s to make a Grand Slam fourth round, outplayed Sabalenka – tipped by many as a title favourite – in every way imaginable. Even Serena said she was impressed. The future is very bright for Anisimova. Remember that name! – Frances Tiafoe’s description of Anismova’s win over Sabalenka was brilliant. “I mean, she’s got everything. She’s got everything. It’s like she’s been a veteran, she’s going out here and Sabalenka is playing great tennis, she routined her like it was nothing. It was barbecue chicken for her. It’s unbelievable,” he said of his compatriot. – Ace machine Milos Raonic was asked if he thinks aces should be included in a players’ winner count. “Are you biased about that by any chance?” a reporter quipped back. “I’m always trying to pad my stats,” responded Raonic. – Sloane Stephens press conference took an interesting turn after her third round win over Petra Martic. Stephens’ family owns a funeral home and apparently she enjoys many aspects of the family business. “It’s cool, a lot of dead bodies. I think that a lot of people are scared of dead bodies but you can’t be scared, they’re like the only thing that you shouldn’t be scared of. You should be scared of people walking around because you don’t know what’s going to happen,” she said. Is she used to being around dead bodies? “I don’t think you ever get used to it, but I’m like into the bodies and cremation – I like that stuff. I’m kind of strange. I like embalming, seeing the bodies, that type of stuff. I don’t like dressing the bodies, I’ve had to do that and I don’t really like that. But making them look nice for their family to see them one last time is rewarding,” she added. On-court interviews are often a toss-up but when Jim Courier is asking the questions, you can almost 100 per cent rely on the fact that something hilarious is going to happen. In his on-court interview with No. 4 seed Alexander Zverev, Courier asked the German about his fitness trainer Jez Green, who previously transformed Andy Murray’s physique. Courier asked Zverev how much weight he’s been able to put on since he teamed up with Green five years ago. “You can’t really tell still, I’m disappointed in that. I’m still called a ‘skinny dude’ on tour for some reason, even though I put on about 15 kilos,” admitted Zverev. Courier suggested Zverev try wearing sleeveless shirts like Rafael Nadal, to show-off his arms. “No, no, who’s going to be scared of that really, Zverev said while lifting his shirt sleeve to reveal his biceps. When Rafa puts that on, it’s intimidating, if I put that on, they might start laughing. I’m just going to keep away from the sleeveless,” added Zverev. “No,” she replied sarcastically, sending the crowd into a fit of laughter. – Frenchman Lucas Pouille scoffed at the idea that his coach Amelie Mauresmo is faster than him. Pouille has posted a couple of videos from his training, in which he and Mauresmo were running on side-by-side treadmills, and another with them running on a track. Mauresmo looked like she was outpacing him both but he insists that is not the case. McEnroe asks Rafa if he wants to thank his physio Maymo.